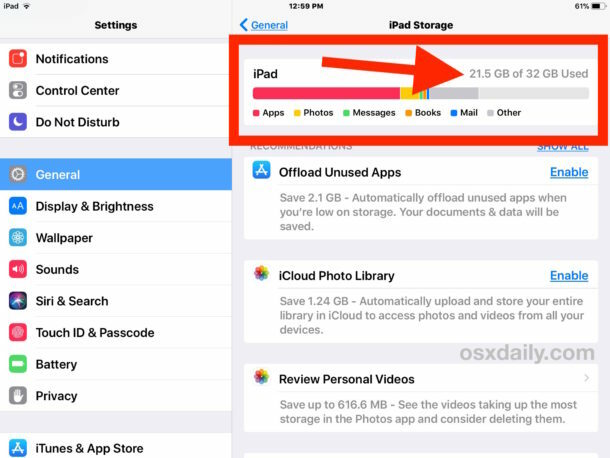 Knowing how much space you have used on an iOS device and, maybe even more useful and more relevant, knowing how much storage you have remaining, are two important things for any iPad, iPhone, or iPod touch owner. 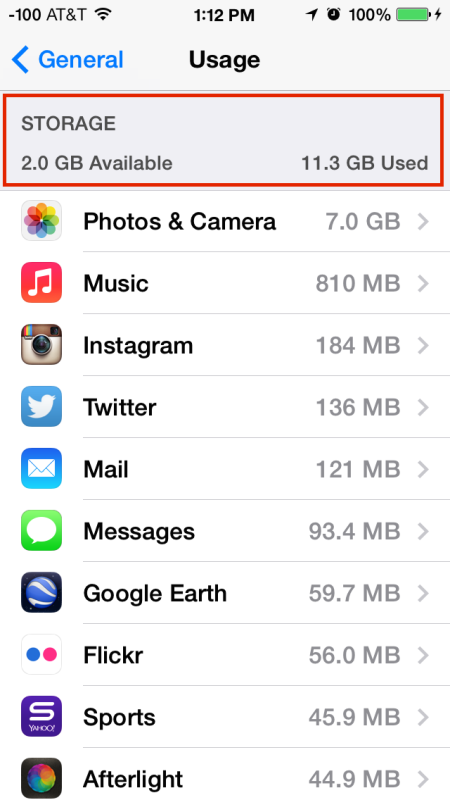 As you can see, the Storage calculation will give you the amount of storage currently used, and going further it will break the storage used into sectional categories, like apps, photos, videos, Other, and so forth. This applies to all modern iOS versions, from iOS 12, iOS 11, and iOS 10 and obviously anything newer than these as well. If you have a newer iPhone or iPad, you probably have a new enough system software version that the above steps apply to you. Older iOS versions are slightly different to check available storage. Scrolling further down you’ll find how much space individual apps use, most of which are reasonably small but some games like Rage HD are enormous and will take up tons of MB’s of capacity. If you don’t find yourself using the largest apps in this list, or if you’ve already beaten a game and don’t play it any longer, you can always delete them now and then redownload them anytime in the future for free, all you need to do is go back to iTunes and the Purchased list to be able to access any apps you’ve bought or downloaded in the past. A few other important things to note: The Videos app shows a combined total of video storage on the iOS device, if you’re experiencing capacity issues you may want to remove individual videos that you have already watched, as each one can take up quite a bit of space as well. It’s not uncommon for HD video’s to be several GB large, meaning just a few of those will have eaten up all but the largest capacity versions of iOS hardware. Finally, and particularly for iPhone users, check the Photos & Camera section too, because photos can also take up tons of space and knowing how much storage they’re using is a good way to determine if it’s time to back all the pictures up to a computer so that you’ll be able to remove them and take more, if you don’t regularly transfer the pictures to a computer and run out of space while you’re on the go, you’ll be stuck having to manually delete them to try and clear up space, and that’s no fun. Cool, I always checked the General>About section, but this is much better. 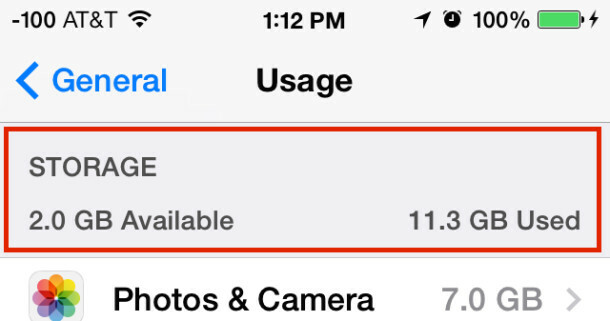 Funny how I have been in the Usage section often but did not notice the Storage #’s. You can Save lots of space by using home sharing with iTunes rather than local storage. I deleted all my stuff I don’t really use anymore, and I did the math. The apps that I have left are not adding up to the storage I have left… Meaning there should be way more space left than there actually is. How can I find out what’s actually taking up space? Reboot your iPhone, the caches eat up space until rebooted. Otherwise back it up to iTunes then restore, that always frees up space. iOS is very inefficient, Apple hasn’t fixed it. The used space by apps doesn’t add up to what is used and what is avalible. I should have at least half my space left. I’m constantly at a few hundred megabytes avalible. I also am finding numerous photos missing from my Facebook albums ( I’m an artist), but yet that is the highest amount of used space, which is only 3.87 GB out of 32 GB I should have about 15 – 20 GBs free. I don’t have time right now to add up all that are X amounts of kbs or 10 -30 or a bit more Megabytes.